On the Muppet Wiki, there is a "Random Muppet" button which sends you to the page of one of the thousands of Muppets in existence. I will press the button and discuss the importance of the Muppet that comes up, no matter how obscure. No skips. No redos. This is the Random Muppet Challenge. Muppet Universe of Origin: General "Muppets"
On April Fools Day, 1994, Kermit the Frog stepped in as guest host of Larry King Live. He interviewed a normal array of guests, including news anchor Ted Koppel, wrestler Hulk Hogan, actress Carol Alt, and presidential advisor David Gergen. The show was peppered with appearances from other Muppets, both visually and calling in, but it wasn't until the very end that a non-human was interviewed. 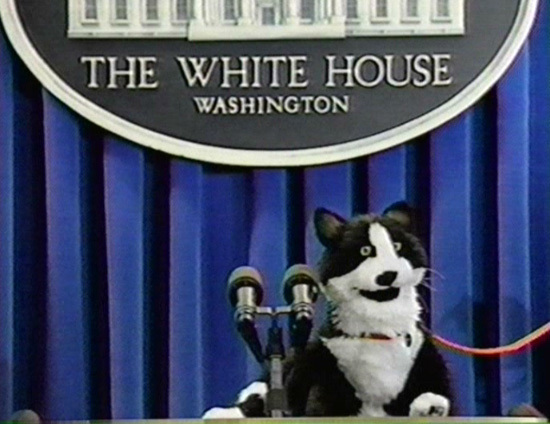 That "person" was Socks the Cat, First Cat of the United States, owned by the then-current President Clinton. 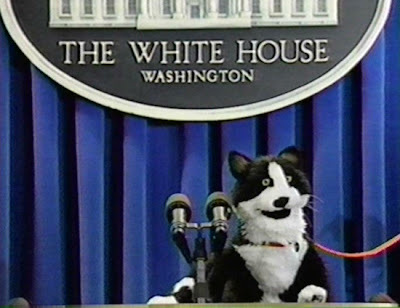 Presidential pets are basically living PR campaigns. They humanize the elected official and allow for the general public to feel closer to the White House. They have a cute puppy or kitty just like us! That makes us like them more! But Kermit wasn't going to stick with cutesy stuff. He was there to ask the hard hitting questions. In a spoof of presidential "scandals," Kermit analyzes the first missteps of Socks the Cat's term in office. Socks must explain his uncalled for behavior as the cameras capture his attacks on other cats. Kermit amusingly is shocked and appalled by what he sees and the Cat must come up with valid talking points to remain in the audiences good graces. He eventually works himself into a hairball-hacking frenzy as he is escorted offstage by his advisor. Why Is He the Best Muppet? The nature of celebrity is fundamentally absurd. There are three basic types of people who become famous: those in politics, those in the entertainment industry, and those who change the world through science and humanitarian efforts. Yet, despite their roles and validity as human beings, we treat them all the same as the collective "celebrity." We analyze how they dress, what they eat, who they interact with, where they go, what they do, how they look in a bikini, what they accidentally said to their mistress, how they sneezed, etc. If a non-celebrity meets a celebrity, they get excited because they have interacted with a person they recognize who has no idea who they are. We are in awe of these people. We treat them like royalty. And we treat them like dirt. Because there is nothing more interesting than a good piece of gossip. In the high school of life, celebrities are the popular kids that outshine the rest of us. And we love to see them fall. In politics especially, minor gaffes and scandals can be blown out of proportion as evidence to discredit these people's characters. Some scandals are worthy of discussion and important to follow up on, but others are completely ridiculous. If you watch any major news channel, you can tell by the extreme severity of their graphics that we have trouble distinguishing what is actually crucial knowledge in the world of political snafus. Socks exists to highlight our insatiable need to scrutinize our celebrities. This interview came out before Clinton's career defining scandal, but if anything, that only increases the relevance. Kermit pulls out a piece of damning evidence, trying to put Socks on the spot to explain his actions. He is behaving like a normal cat. He may be misbehaving, but a lot of cats misbehave. He just had the misfortune of being a cat that people looked up to and constantly observed. He has no privacy. Every misstep is added to his permanent record and it tarnishes his reputation and actual service to the country. Socks is just a cat trying the best he can. Perfection is a terrible burden to place on a little kitty.